Business is booming right now at Maclift Ltd and its Managing Director Eamon McAleenan is intent on keeping it that way down Dundalk way. Irish Trucker found out all about this thriving commercial vehicle body building outfit from the man himself recently. Established in 2002, Maclift Ltd specialises in manufacturing vehicle recovery equipment to customers’ specification. Eamon McAleenan is the company’s owner and founder and is a man who can boast 40 years’ experience in his chosen industry, having worked all over the north of Ireland before eventually starting up his venture just outside the town of Dundalk. Maclift Ltd’s official address is Shelagh, Hackballscross, Co Louth but its excellent reputation has spread all throughout the Dundalk region and beyond over the past decade-and-a-half or so. For Eamon, it has been about building the company year on year to the point now where they’ve built a long list of clientele which continue to bring repeat business. The man himself spoke to Irish Trucker recently about his thriving and unique company which continues to grow stronger with each passing year, with further expansion possibly on the horizon. “I was in business in the north for a long time. I suppose you could say I have 40 years’ experience in this even though the company was established in 2002,” said Eamon. Eamon hints that it’s perhaps getting to the stage now where he’ll have to look at taking on a few more employees in order to keep up with the demand from clients. So what is it that makes Maclift Ltd special in that its customers are continually choosing them first ahead of others in the very same game? The company’s founder and Managing Director breaks it down when you put the question to him, while also outlining exactly what is it they have to offer at Maclift Ltd.
“Basically, what we do here is manufacture vehicle recovery equipment to customer specification,” he said. “We can get in the chassis cab for the customer – whatever they want, we can do it for them. We have customers coming to us from all over Ireland and the UK and we’ve always ensured to carry out work for them to their own specification. Often found in medium duty truck commercial vehicles, the chassis cab is a body style as well as a type of vehicle construction. 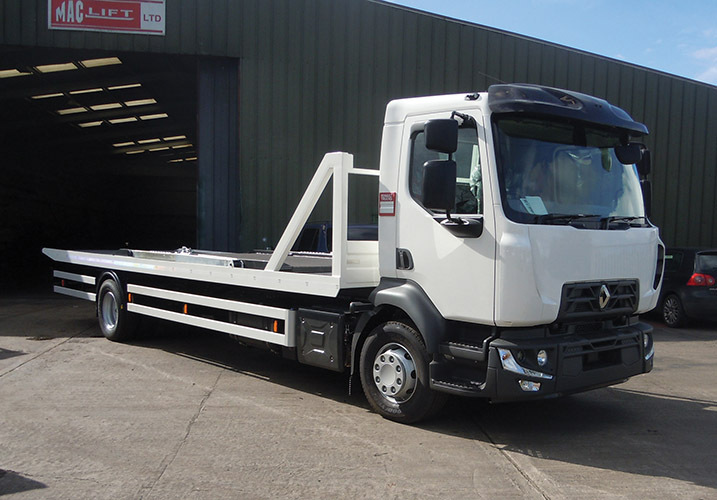 This sees the customer being given the vehicle with the chassis rails and a cab rather than the pre-assembled flatbed or cargo container, allowing them to assemble or customise it to their own specification. Maclift Ltd brings in the chassis cab for the customers and it’s a service they’ve been offering since Day One. For now, the plan is to keep things thriving out in Hackballscross, where 40 years of experience in the industry are utilised into manufacturing vehicle recovery equipment to the specification of clientele. And, as ever, customer satisfaction remains the top priority above everything else and a commitment to quality is evident as they are AVBB approved through the NSAI. “Business has been very good lately,” Eamon beamed. “To be honest, if it keeps going this way we’ll have to up the pace a little bit and bring in a few more lads. The plan now for Eamon and Co is to keep ensuring that the customer demand is met week in, week out as the company edges closer and closer towards 20 years in business. At the moment, things are very much headed in the right direction towards that milestone for Maclift Ltd.
As far as Eamon’s concerned, he is very proud of what his business venture has achieved to date and hopes to continue to grow again in 2019. “There aren’t too many companies like this one that are approved for recovery trucks like we are. So between that - and the service that we give – I think it’s why our customers tend to choose us first ahead of other competitors out there,” he concluded.